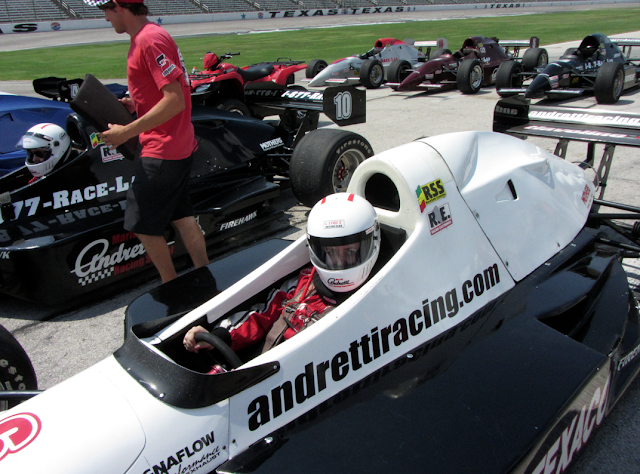 Driving an Indy Car!!! ~ Learn, Live, and Explore! Oh, do I have to write more than that one sentence? But doesn't that say it all? OK, fine. But before I do, a little background. I went to my first open-wheel race in 1995, and from that day forward I loved racing. My obsession with the sport was intense for the first 6 years, focused mostly on the (then) CART open wheel series. Alas, it faded as I found my attention being drawn in many other directions. But my love for speed and adrenaline on a track has never left. 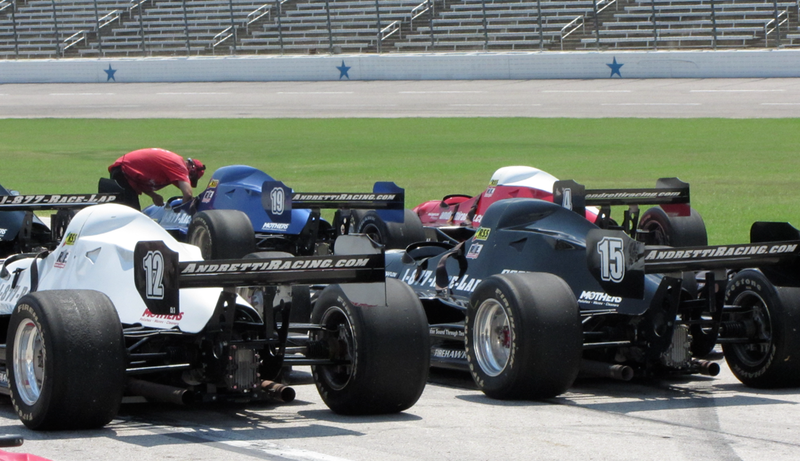 Recently, a LivingSocial offer popped up for the Mario Andretti Racing Experience. I drove a NASCAR last summer, and it was fun, but nothing could compare to getting into the cockpit of an actual open wheel racecar - my young adult racing fantasy come true! 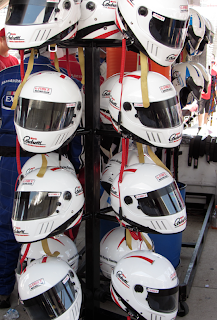 The track experience deal included a one-on-one training with in-car radio communications and a five-minute racing session for about half the normal cost. I ended up buying 3 additional minutes of tracktime to ensure I got enough laps to make the experience worthwhile. Before I even set foot on the track, I had to first select which track to drive. The obvious choice, given its proximity, was Richmond International Raceway, but that was the location for my NASCAR drive and the track was very short - uncomfortably short. So, I decided to go to Texas Motor Speedway because not only was it a lot longer, 1.5 miles or twice as big as Richmond, but it had 24 degree banking on its turns. Can we say "fun!"?? 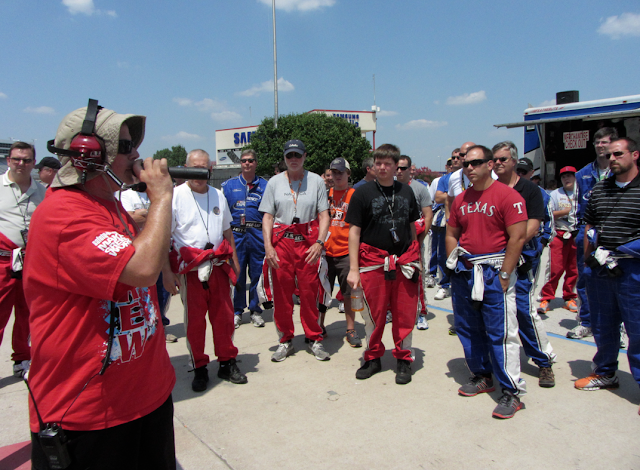 After checking in at the track, we waited to be called to the drivers meeting where we got a safety lesson on track specifics - staying above the line that designated the "apron" on the corners, where the racing line is on the front and back stretch, passing protocol, etc. We were also told that our objective was to eventually, through coaching from your spotter, get our speed up so that we were hitting the revlimiter - or the device that regulates the maximum speed for the indycar. They also stressed that, contrary to our natural instincts, we were to do whatever possible to NOT lift our foot off the accelerator -- what!!!??? Yes, I know the car was designed specifically to create downforce on these curves at TMS, but seriously not slow down? After the drivers meeting, we had a meeting with the crew chief who reminded us, again, of the key safety points, especially staying at least 5 feet above the white line on the curves - emphasizing that if we touch the paint, we will go into the wall. Yikes! The advantage to getting to the track early meant that I was in the first group called - yahoo! We got our ear buds for the in-car communication system that linked us to our spotter, who was providing us with instructions while on the track. Then, with helmet on, I sunk into my cockpit bucket seat, got my 5-point harness buckled, attached my steering wheel, and prepared to be shuttled down pit lane by a 4-wheel ATV. When told by my spotter, I had to pop the clutch and give it gas....and the heavy concentration and maybe a too tight grip on the steering wheel began!!! The first lap was a giveaway because it was spent building speed and entering the racing line. I worked on understanding how sensitive the steering wheel was to movement. It was unbelievably responsive to the smallest of turns. I barely had to even move it to the left on the corners! I'm not sure exactly how many laps I was able to complete in my 8 minute session, but I really did try my best to hit that revlimiter. I never did hear the sputtering noise that indicates I triggered the device, so I can't say that I went as fast as I possibly could, but I went as fast as I felt comfortable. The computer clocked me at a 158.16 mph top speed. Not too shabby! 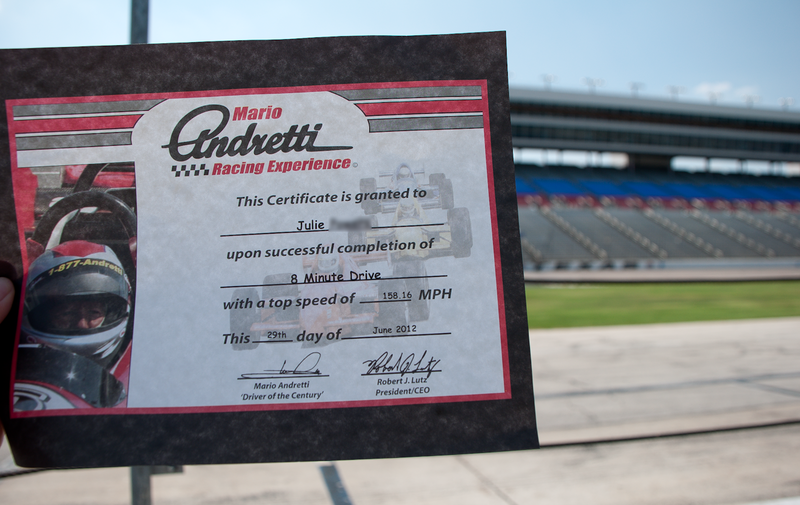 While the experience was amazing, it went by so fast I can't even recall every sensory detail about the drive itself. But I can say two things: I have checked off driving an indycar from my bucket list and, were I to do it again, I think I'd like to stick to the road courses with right and left turns. Vroom Vroom!